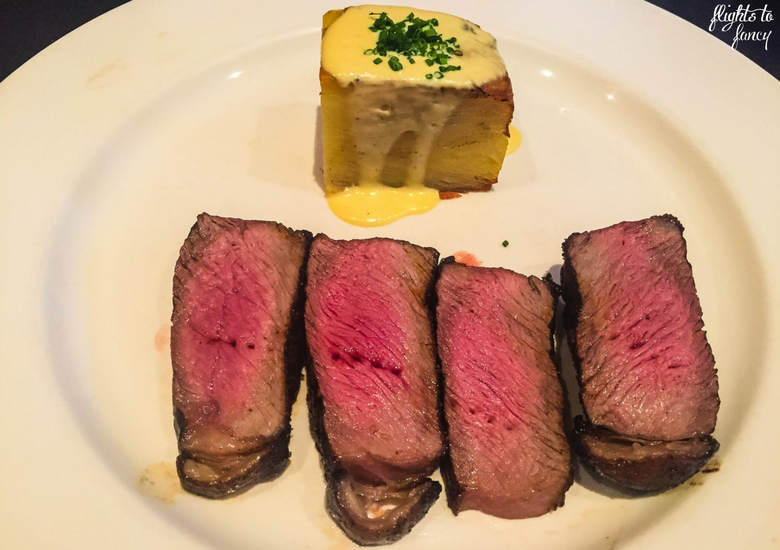 Black Cow Bistro Launceston: Australia’s Best Steak? I mentioned in my recent where to eat in Hobart post that I always try to support local produce. 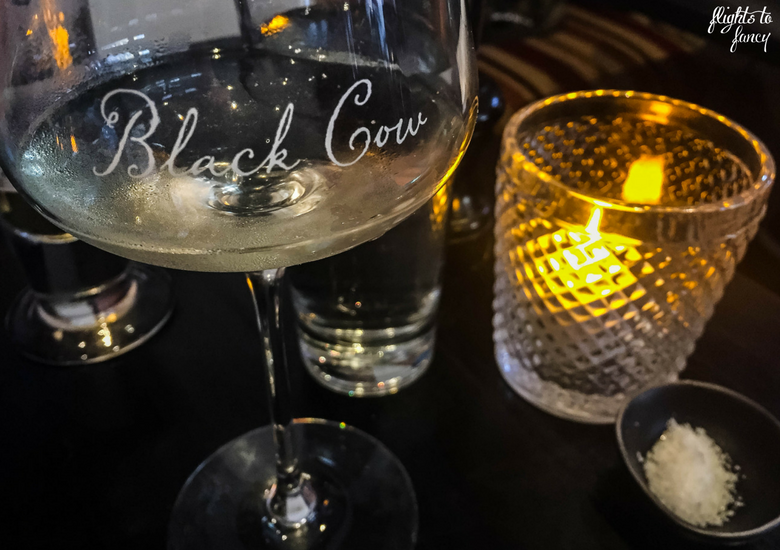 The Black Cow Bistro Launceston takes pride in presenting diners with the very best dry aged, free range, grass-fed, hormone free, premium Tasmanian beef. 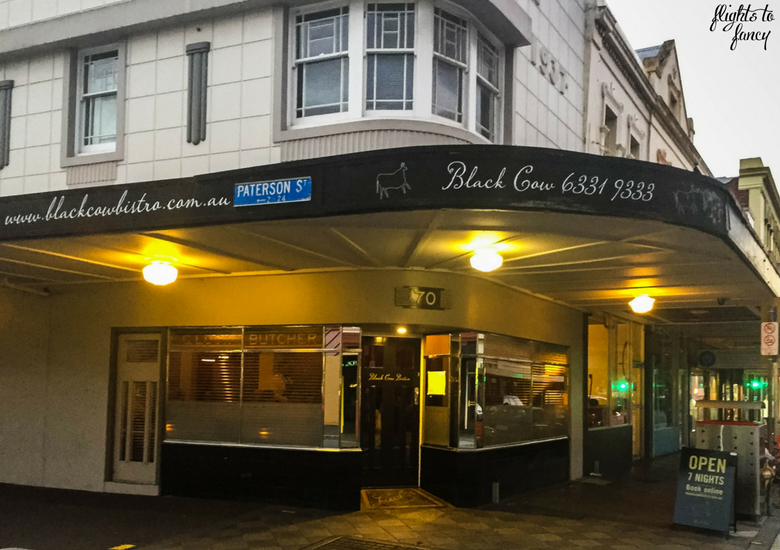 Located in the heart of Launceston City on the corner of George and Paterson Sts, The Black Cow Bistro Launceston is steps away from where we stayed at The Grand Chancellor Hotel Launceston. and across the road from The Prickly Cactus where we also dined. The corner restaurant’s dining room is compact, seating around 50 guests, but there is room for 12 more in the semi private room at the rear. The decor is minimalist and the tables are close together to make the best use of the limited space. The subdued lighting sets the perfect scene for a date night but it’s not so dark as to have you guessing what’s on your plate. 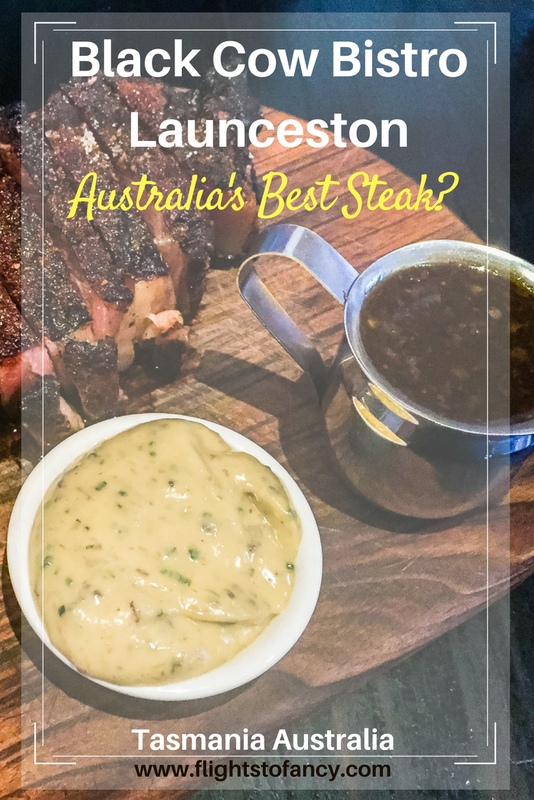 If you have read any of my previous restaurant reviews you will know I advocate checking TripAdvisor ratings before you dine and it would be remiss of me not to mention Black Cow Bistro Launceston holds the number 1 spot of the 229 restaurants in Launceston. The name makes it pretty clear that beef is the star of the show here. 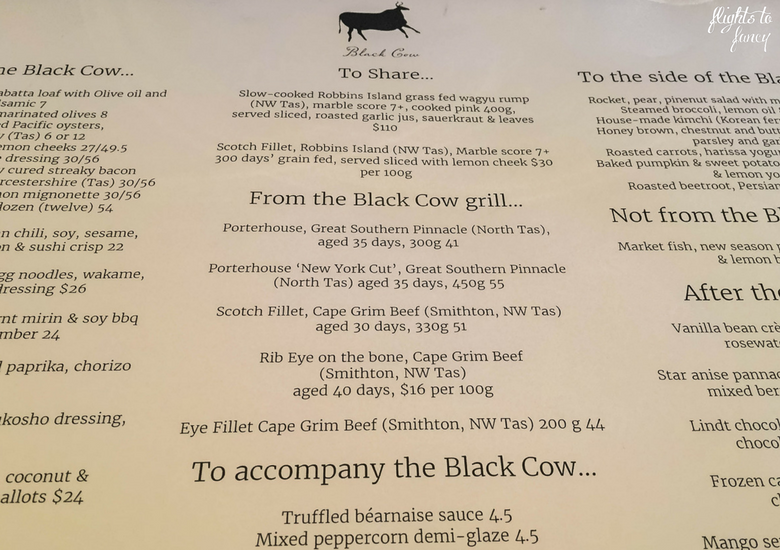 For those that are slow on the uptake, the tight menu lists ‘before the cow’, ‘the black cow’, ‘to the side of the cow’, ‘to accompany the cow’ and ‘after the cow’ as options to hammer the point home. Non beef eaters have one choice; market fresh fish of the day. Steak sizes range from 200g to 450g and I love that you can order some cuts in 100g increments. As some of the steaks are very generous, Black Cow welcomes sharing, which is refreshing. Not only will this prevent you from overindulging, but it also allows you try out more than one option if you are so inclined. We elected to share a 450g New York cut porterhouse with truffled béarnaise (me) and peppercorn (The Hubs) sauces. 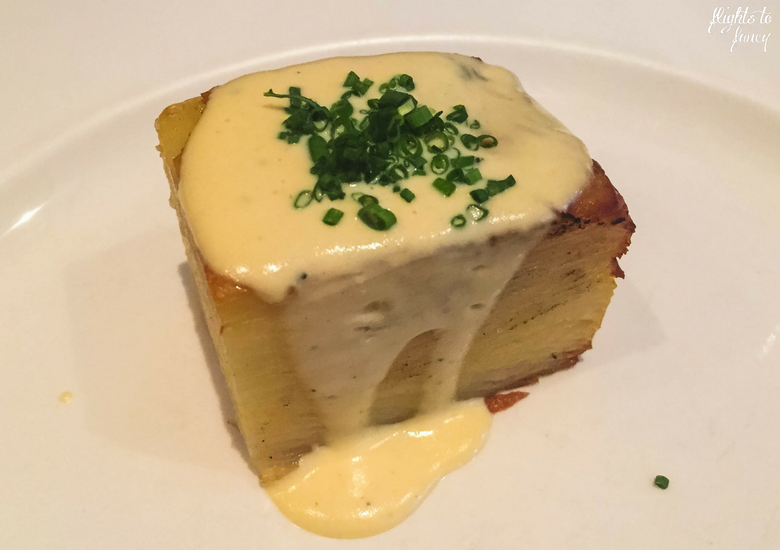 Even when sharing, each diner gets an individual serve of potato galette with dijon cream and chives. We spent the day visiting Cataract Gorge and had worked up quite an appetite. A good steak takes time to cook and to keep the hunger pangs at bay while we waited, we chose the house made ciabatta loaf to start. 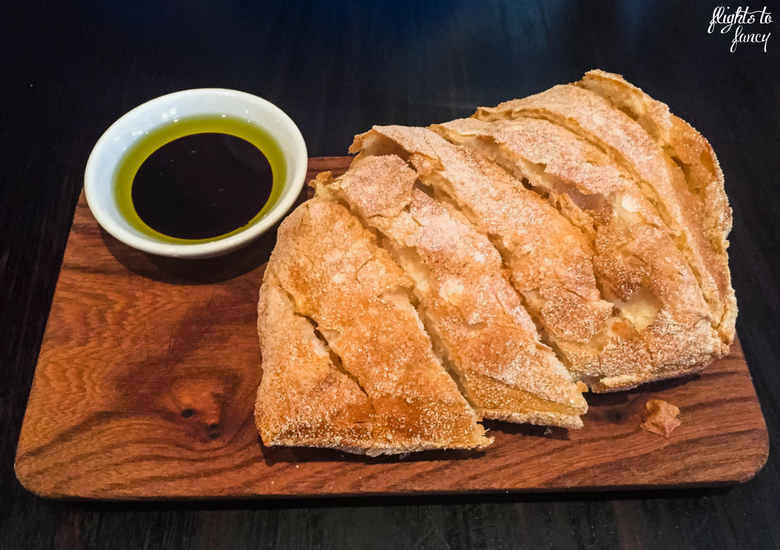 The still warm bread comes with a delightful olive oil and balsamic dipper which prepped our taste buds for what was to come. The Black Cow Bistro Launceston offers a number of sides and we chose one each to share. 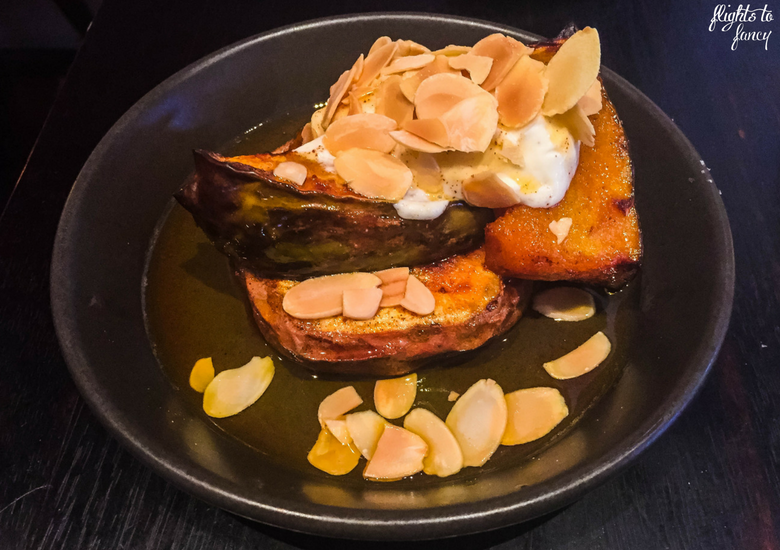 I couldn’t resist the roasted pumpkin and sweet potato with almonds, brown butter and sumac spiced yoghurt. 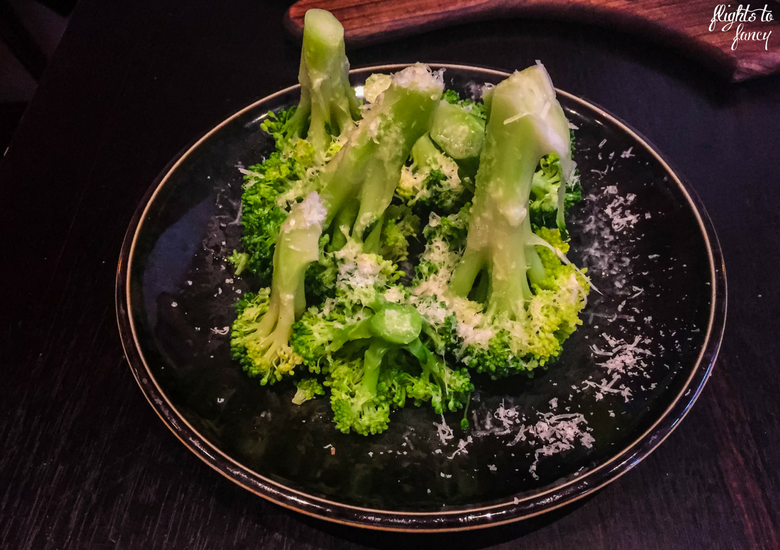 The Hubs is more of a purest and chose the steamed zucchini with lemon, chill dressing and parmesan, but on the night we dined broccoli replaced the zucchini, which suited us just fine. When the food hit the table we could barely contain our delight. The steak was cooked as ordered (medium) and served sliced on an embossed wooden platter. We each got four generous slices from the portion, but I couldn’t finish my last one. The Hubs certainly wasn’t complaining as he claimed it as his own. Our steak was exceptionally lean and butter soft tender, just the way we like it. The lemony yoghurt sauce and almond flakes on the pumpkin and sweet potato were sensational and the potato galette was one of the finest I have ever eaten. The sides were so generous that despite how lovely they were, we couldn’t make it through the entire serve of either. When you step inside you will notice there is no reception area at Black Cow Bistro Launceston. Don’t worry, you won’t be left wondering where to go as the attentive staff greet you almost immediately and show you to your table. Make sure you book because this cow is mighty popular. Our host explained each menu item in detail, including advising of unavailable items. Tasmania is cold at night, even in the height of summer. My long coat didn’t hang neatly on the back of the chair, but clearly the Black Cow is accustomed to patrons being bundled up as they efficiently whisked it away. Our server was attentive, friendly and discreet all at the same time but never pushy. Black Cow Bistro Launceston has clearly taken the time to think through all the little details. I loved the etched wine glasses and the unique pouch the bill was presented in. Does the Black Cow Bistro Launceston appeal to you? I would love to hear your thoughts in the comments below. Disclaimer: This post is not sponsored. We paid for our meal at The Black Cow Bistro Launceston in full and as always, all opinions are my own. This post contains some affiliate links which will earn me a few cents to contribute to the running of this blog if you make a qualifying purchase. I would like to recommend this place to my friends. They will definitely like eating at this place. $133 is pretty normal by Australian standards, so the price tag doesn’t put me off – the food looks INCREDIBLE – and makes me even more excited – we’re moving to North Tasmania in exactly two weeks from today, and will be an hour out of Launceston. I know that’s a long drive by Tassie standards, but up on the mainland that’s normal peak hour 😀 So I can’t wait to start exploring Launceston’s food scene, and will start with the Black Cow Bistro 🙂 So glad you’re enjoying your time in Tas! We did share the steak so I though it was reasonable for such a great meal. I hope I make it back there again soon! The steak looks divine! Perfectly cooked! I think it’s a testament to a restaurant who can cook a really good steak – just the little touches make all the difference. I’ll definitely be adding the Black Cow to my Lauceston Itinerary! Make sure you get the bernaise sauce Vicki! Divine ? I can see why you didnt miss this. The food definitely looks scrumptious! Im not a big meat fan but boy do those other dishes look fine. Will definitely recommend this to my australian friends! Hope you make it to Black Cow soon Stephanie! I hope you can get to Tassie soon Divsi. Vegetarians are very well catered for as well! Great tip for checking out lunch options Julie. I think this is something that I have done unconsciously but will definitely look at this a lot more closely now. There is nothing quite like treating myself to a great steak when I am in Australia. We haven’t been to Tas yet, but I am sure we will get there. 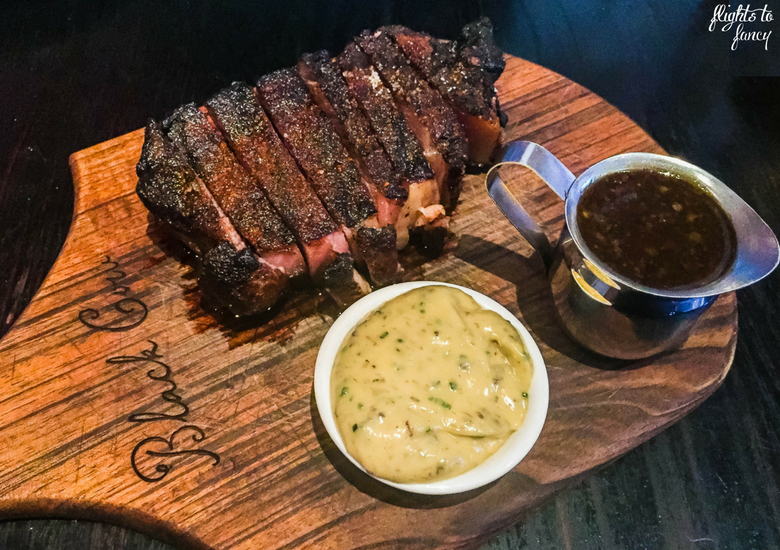 We have enjoyed many wonderful steak houses in Melbourne and Sydney, so if the Black Cow Bistro is Aussie’s best, I know it will be a real treat. I do hope you make it to Tassie Rhonda. It’s such a beautiful part of the world. Australia’s best steak is a big call but Black Cow is certainly up there in my opinion. Looks like a great place to eat for people who relish red meat. This is probably one of the very few times I have heard that a meal is more expensive than the airfare. Lol Nisha I never thought of it that way! Eating out is expensive in Australia so I guess we are used to it ? That’s exactly my kind of food!! I am sure it is as delicious as it looks.. not sure we will make it ever to this restaurant (or Tasmania which would be too bad) but I wish we would! Put Tassie on your list Lena! Everyone should visit at least once! I love a good steak! I’d personally go for the Scotch filet, but I’d also choose the truffle bernaise sauce. I was trying to eye up the dessert choices on the menu and I can never pass up creme brulee. It all sounds delicious! OMG the bernaise was divine. You. Any go wrong with a scotch fillet! We had thoughts of dessert but honestly, there was no way we could fit it in! You would love the sides Chiara. The pumpkin is sensational! It was Chiara! I’m sure you would love the side dishes ? Agreed that our (U.S, U.K and Aus) prices look insane when coming back from Asia or Latin America! I have to try and get to Latin America one day. Working my way through SE Asia first. I am not into steaks and especially not cows. However, I can always pass on this information to my friends in Australia. Have heard a lot about Tasmania. Have to visit it one day. I can understand that Mankulika. It’s certainly not for everyone. I hope you make it to Tasmania soon. It’s such a beautiful part of the world. Sharing is definitely the way to go Danijela! I haven’t been to Argentina Maria but I hope to one day ? I was very impressed with the way the food was so beautifully presented at the Black Cow Bistro. In America, cows are pumped with so many hormones and other gross things. I’m sure the flavor of the meat is even more delightful without all the chemicals in them. It really was a lovely setting. Just a little bit posh without being pretentious. That steak looks divine! I would go back to eat there too, it looks amazing. The way you described the steak was something that titillated my taste buds too! I would keep this in mind should I make my way to Tasmania soon! I hope you do! Hands down my favourite meal in the apple isle ? Wow! This is my kind of place! I haven’t had good beef in a very long time so this post makes me want to pack my bags and go just for this! That roasted pumpkin looks amazing, too. I love dining at a place that has thought everything through and the people know exactly what to do to make the guests welcome! It was a great experience Taiss. I wouldn’t hesitate to return ? By just going through your photos it looks like this place has the best steak in Australia. For anyone visiting Australia this could be one place they would love. We are vegetarians but can recommend this to our friends. It’s a big call as Australia does exceptional beef but I think so! Haha that does look like a hell of a steak. I say that as a vegan! It’s always nice to find a place that really makes your mouth water. Well if a vegan can appreciate it they must be doing something right! I sure you would love the side dishes Kristina. The pumpkin was divine ? Wow! The food looks incredible! Good service and genuinely friendly and attentive staff always make the world of difference as well ? Sure does Rhiannon. The Black Cow got everything right! First, the food looks AMAZING! I rarely eat steak, but this looks like one of the best steaks out there! Secondly, I love the presentation on the wooden board and the etched wine glasses. Little things like that really stand out. Kudos to them for having a coat check too. It frustrates me when I go to a nice restaurant and I have to hang my coat on the chair behind me. I rarely To either so if I am going to indulge it better be good. Black Cow was exceptional! Oh my goodness! While I must admit I don’t have steak that often, I wouldn’t argue that this place might indeed be the best steak restaurant in Australia. Judging by the photos, this would be hard to dispute as it looks really divine and decadent. It tends to make a powerful argument for adding to the reasons to visit Launceston. Can’t wait! It’s a big call but in 45 years I can’t remember having better Nicole. And I have eaten a lot of steak! I am from South Africa and we have a lovely steak here, but recently a friend went to Australia and couldn’t stop raving about the Australian steak. I must admit though that even the other dishes you tried looked delicious! It was all delicious Sabs. You have to pop down under and give it a try! I’m not a huge fan of meat, but everything else sounds totally delicious. 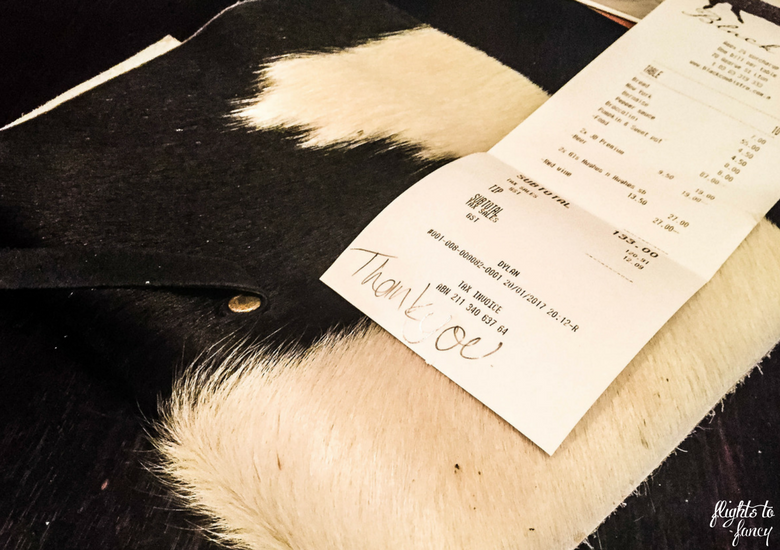 Glad you enjoyed dining here and it certainly sounds like a great place for people who enjoy ‘the cow’ haha! All the side were also delicious … especially the pumpkin and sweet potato! I’m not much of a meat eater but even I was salivating just a bit looking at these photos of the steak, it looked like it was cooked to perfection. Launceston is such a great little city and the food sure is tasty in Tasmania. Will have to keep the Black Cow in mind next time I make a visit. It was sensational Sasha. I’m not a big meat eater myself so when I do steak I do it well! Visiting a number one ranked restaurant is always a treat! We always travel with the kids and sometimes choose a place like this to give them the experience of fine dining. They need to learn how to handle it. You never know when you might get asked to dine with the queen, right? You need to be ready!! This looks like an amazing place. It was one of my favourite meals in Tasmania! Such good eating down there ? It’s at times when I come across blog posts like this that I thank my lucky stars that I’m not a vegan. Literally drooling over here, this looks so delicious! Fly over to London and drop me off a takeaway pleeeease?